I must own at least a dozen blankets and throws. It's kind of ridiculous, you guys. Obviously one does not have a need for that kind of quantity of covers in a tiny two bedroom apartment, but I can't resist a pretty textile when I see one. Colorful patterns, intricate weaves, cozy fibers, that kind of stuff just gets me going! Alas, there are only so many beds, chairs, and couches in my home on which to casually drape a blanket or toss a throw, so I had to get serious about organizing my hoard of coverlets. 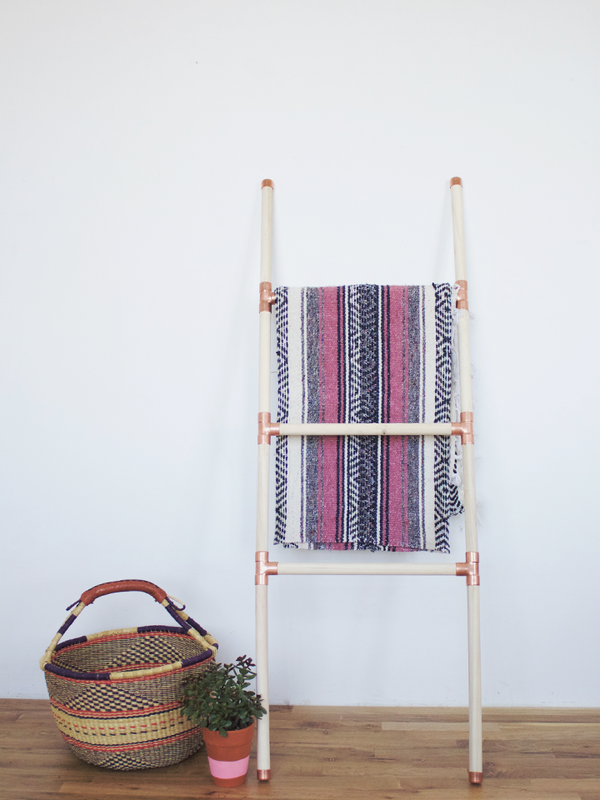 I have had my eye on a few blanket ladders (like this one and this one) but have had a hard time finding just the right one. Then the idea struck to DIY my own. Because, duh, that's what we do best! * I had mine cut for me at Home Depot. You'll have 36 inches of dowel left over, but hang on to that bad boy. 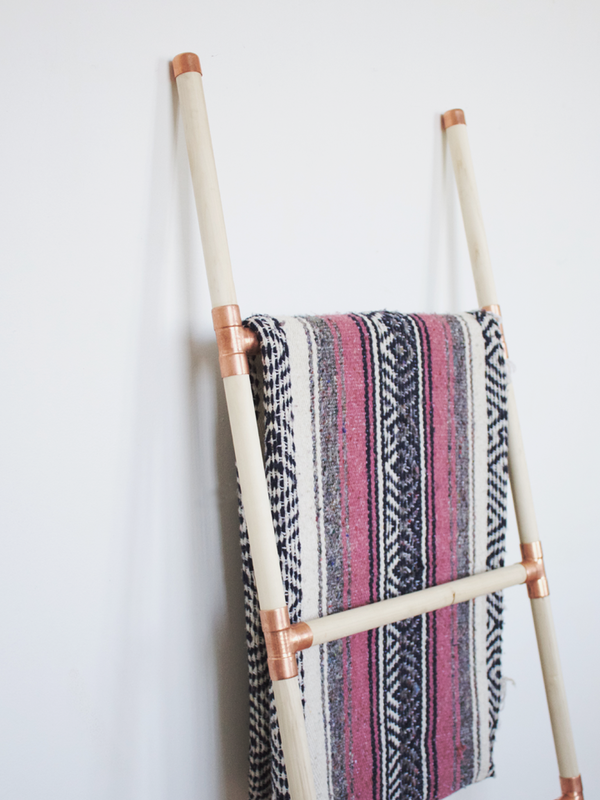 You never know when you'll dream up a dowel involved DIY! Step Three // Working section by section, apply glue to the end of each dowel and the inside of each copper pressure tee and fit together. Make sure you press the dowel firmly in to the pressure tee. Quickly wipe away any excess glue that oozes out of the fittings before it dries. 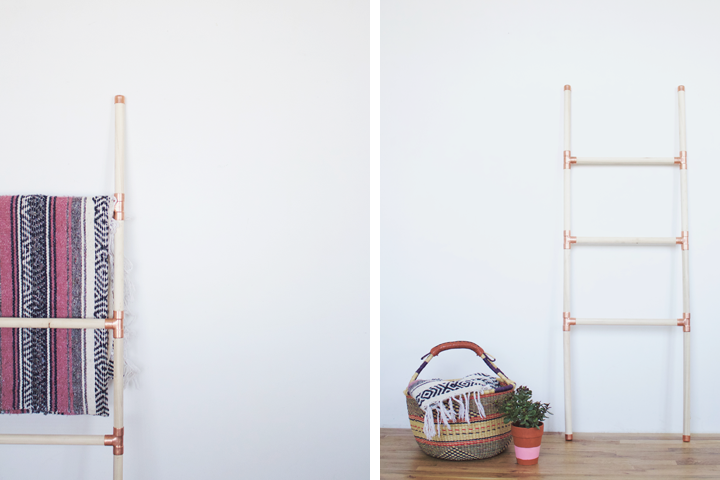 Step Four // Now glue the copper tube caps to the top and bottom of the ladder. Once again, quickly wipe away any excess glue that oozes out of the caps before it dries. Step Five // Double check that all fittings are pressed firmly together and that the ladder is even on both sides. Allow to dry for 24 hours. I'm so happy with the way this turned out! I love the simple aesthetic and the copper details (if there's one thing you know about me, it's that I'm all about those copper details!). I can't wait to show off some of my favorite blankies! What do you think? Love this, gorgeous! And can one really have TOO MANY blankets/throws? Nope. Wonderful ladder and i would like to do the same. I just made this last night, awesome project. A few tweaks.. firstly I stained the dowel using vinegar and steel wood solution to age it a bit (looks gorgeous with copper). Secondly, we used copper nails and nailed each joint onto the wood. Gave it more of an industrial look.. but also, the wood glue will dry up and eventually crack and loosen. Thanks so much for posting this, cant wait to give as an christmas gift! The directions are super clear and I love the design! Well done. This is super cool!!! I need to make one of these asap, I have way too many blankets lying around the place! I love this! Any thoughts or opinions on how it would work if you do everything with 3/4" fittings vs. 1"? Do you think it would be flimsy? Hi Elle! 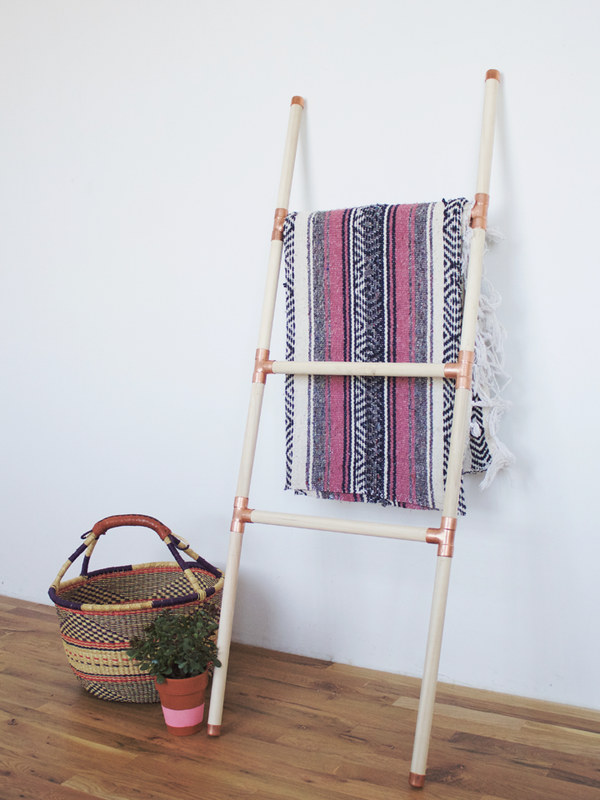 The 1" rods and fittings make this ladder super sturdy. I think the project would still work wth 3/4" but you might want to be wary of displaying heavier blankets! Just tried this with 3/4" fittings and dowels; looks good but the fittings are actually quite loose for some reason, and would easily drop right off were it not for the wood glue. Am thinking I will need to reinforce them to realistically put heavy or multiple blankets on there. Could very well be due to some let-to-be-identified mistake of mine--was a first attempt at this sort of thing, but thought it might be useful to know.